Last modified February 24 2016, 21:40:21 MET. Never Trust A Running System! FMDiff for Windows and Macintosh is a standalone C++ application. 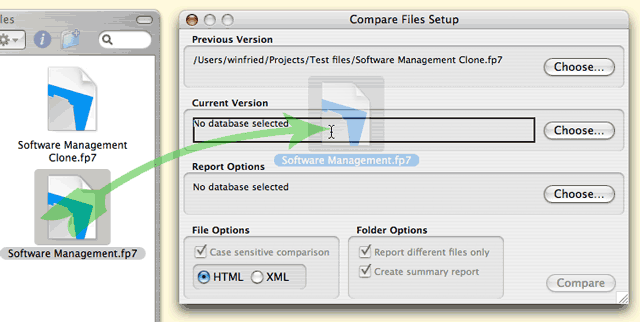 FMDiff is able to compare FileMaker® Pro files or files saved as Clone without the need of any further software. 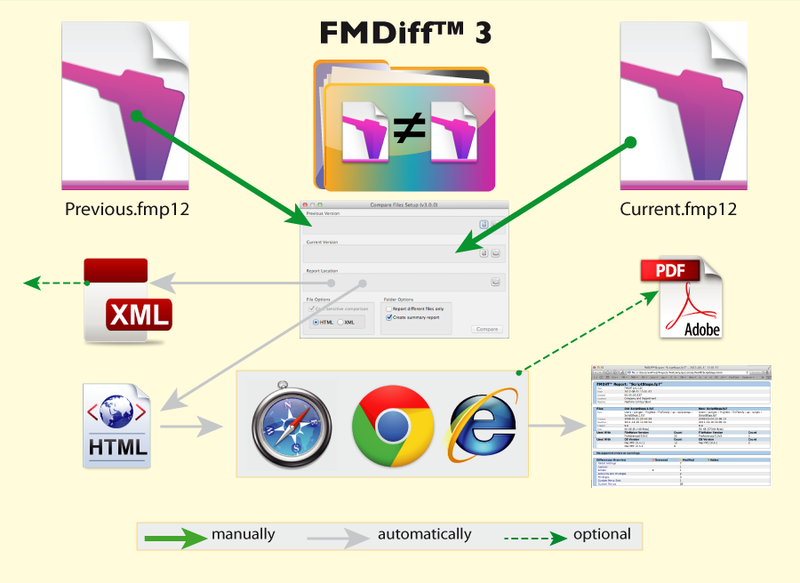 FMDiff reads two files simultaneously and follows the file's internal structure. Whenever it discovers any deviation this will be reported. It also reports any structural errors with an appropriate error message. FMDiff can easily be self-tested and verified by anybody by applying changes to a file and compare those changes to the FMDiff report. It does not test or compare any data entered though, except the number of record changes in the tables are shown. FMDiff uses the file name and the internal element IDs to track identity. When comparing complete folders, files must maintain their names to be recognised. When comparing single files, any files, tables, fields, or other elements may have been renamed. Changes of names will be reported. Elements that change temporarily, like Last find request, Sort order, list sequences of Tables, Fields, Value lists, Scripts, etc., or are related to data entered, are skipped. Open FMDiff and drag the files or folders to compare onto the Previous Version and Current Version slots. Alternatively files can be selected via the Choose button, even over File Sharing. The Report Options are set automatically to the location of the current version. The report name and location is the same as the name of the current version but has an extension either .html or .xml according to the selected file options. The report path and filename may be changed via the Choose... button as well. Existing reports with the same name are overwritten without warning. When both files or folders are selected, click Compare. Typically within a few seconds your browser will open and show the report. Files of several hundred Megabytes will take a few minutes. A progress bar and and the estimated remaining time is displayed together with a Cancel button. FMDiff is a stand-alone application (Windows and Mac Universal Binary) that does not depend on other applications, plug-ins, or a Database Design Report (DDR). It reads the original files, that's why it is so fast. Open FMDiff and drag the files to compare onto its window and click Compare. Seconds later your browser shows the difference report and all file information. Files of several hundred megabytes take a few minutes. Files and folders are supported if FMDiff is licensed. The -x switch is for xml output. Without it the format is HTML. Please note the trailing slash if you define folder paths.